Listings / Red Carpet PRE-OSCAR SOIREE & Jeff Gund Birthday Party: A High-End Networking Event! Special Guests Include Creators, Execs, and Stars from Oscar-Winning & Nominated Films and More! Red Carpet PRE-OSCAR SOIREE & Jeff Gund Birthday Party: A High-End Networking Event! Special Guests Include Creators, Execs, and Stars from Oscar-Winning & Nominated Films and More! 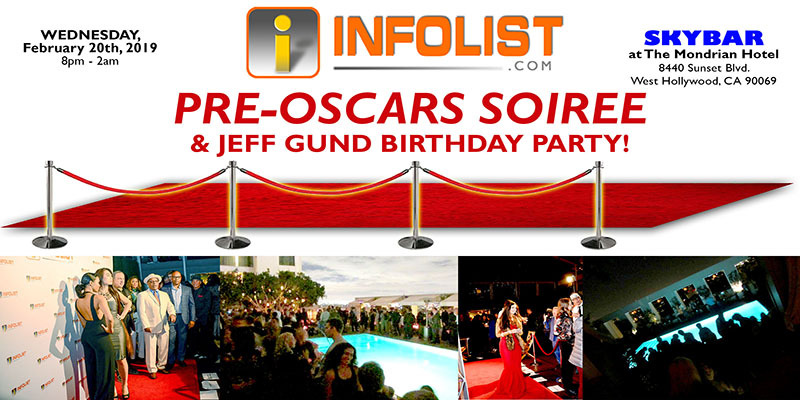 INFOLIST.com is hosting a RED CARPET PRE-OSCARS SOIREE and BIRTHDAY PARTY FOR INFOLIST FOUNDER JEFF GUND – a HIGH-END NETWORKING EVENT! EVEN MORE NEW SPECIAL GUESTS – JUST ADDED! 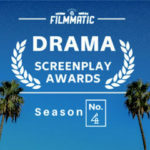 Stars from the OSCAR-WINNING The Big Short, Skyscraper, Altered Carbon, Star Trek: Into Darkness, plus BRETT LEONARD, director of Virtuosity and Lawnmower Man, and more! Special Guests include iconic PRODUCER/WRITER/DIRECTOR DAVID ZUCKER (franchises including AIRPLANE!, NAKED GUN, and SCARY MOVIE), FILM EXECUTIVE RICHARD WALTERS (the Oscar-Winning film WHIPLASH, Oscar-nominated NIGHTCRAWLER), SCREENWRITER JIM HERZFELD (Oscar-nominated film MEET THE PARENTS), with celebrity guests NAOMI GROSSMAN (American Horror Story) and KARA WANG (Good Trouble, Shanghai Calling)! AND MORE SPECIAL GUESTS – including Iconic director RANDAL KLEISER (Grease, Blue Lagoon, Flight of the Navigator), director BRETT LEONARD (Virtuosity, Lawnmower Man), MAYLING NG (starring in Scorpion King: Book of Souls, and as “Orana” in Wonder Woman), Plus stars from The Karate Kid and Cobra Kai, plus the producers of Bring It On, Children of Men, and The Guardian, PLUS the Music Supervisor from the OSCAR-WINNING Hustle & Flow, the OSCAR-NOMINATED Hellboy 2, Avengers: Age of Ultron, and more! PLUS – SURPRISE special guests and celebrities from major blockbuster films I can’t announce yet! Support INFOLIST, and get your tickets now at the link below! And also be sure to get a drink while you’re there so you can drink a birthday toast with me (and because good bar sales ensure I can keep doing these events!)! Please note this event is not affiliated with or endorsed by the Academy of Motion Picture Arts & Sciences in any way whatsoever. INFOLIST.com PREMIUM and PRO Members get 60% OFF!! That’s just $10 (normally $25!) for General Admission tickets, and only $14 (normally $35!) for VIP Tickets with Red Carpet priority access!